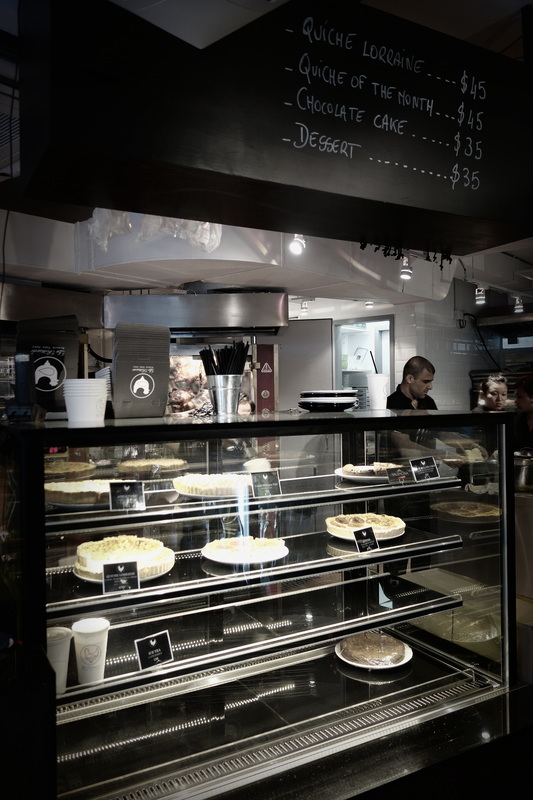 La Rotisserie comes to Wan Chai! 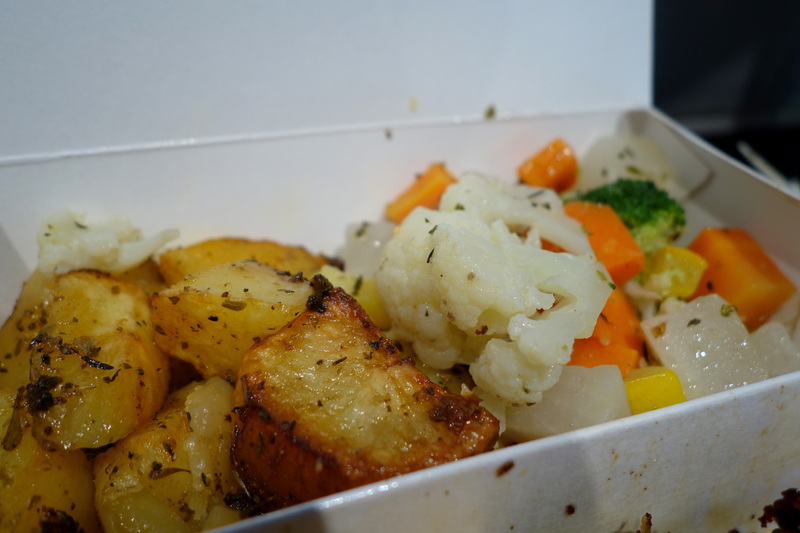 I had heard stories about La Rotisserie in Sheung Wan, when it first opened. I wasn’t about to go all the way to Sheung Wan from my office in Wan Chai, only to be disappointed and cheated out of my chicken. So imagine my glee and excitement when I found out that La Rotisserie has opened in Wan Chai, and that at long last, I finally had the opportunity to try it! For the first few days of opening, they were having a promotion of HK$50 (instead of $68) for a lunch set – 1/4 chicken, a portion of sides, and house-made iced lemon tea or soup of the day (cauliflower and coconut milk = yum) – well, that’s over now folks, sorry! But really, the regular price of HK$68 is very affordable, and what you get for it is worth ever dollar. I have very fond smell-memories of walking down the street in Paris and seeing a huge oven cabinet full of crispy brown-skinned chickens spinning slowly on a spit, around and around and around they went. I could smell them from all the way down the street, far sooner than before I actually saw them. 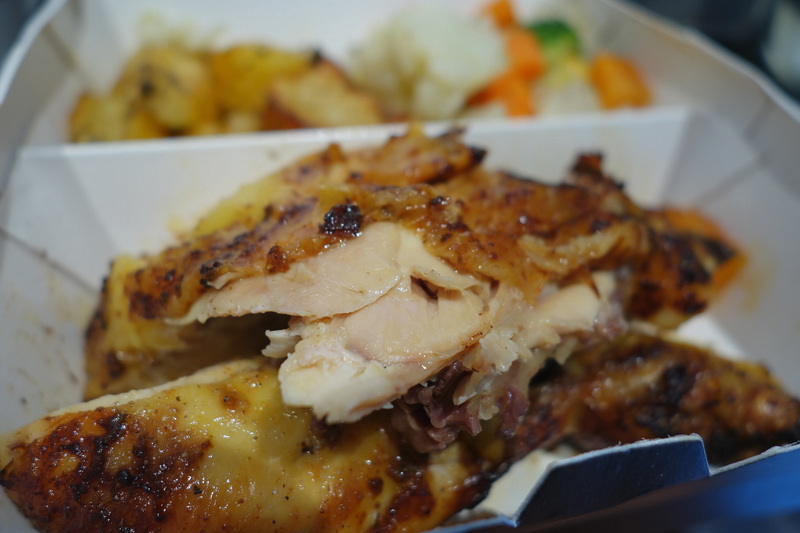 La Rotisserie has brought this beautiful method of chook-cooking to Hong Kong. The do it simply, efficiently, and effectively. The focus is on the ingredients, corn-fed free range chicken from France. They even go so far as to advertise the French producer, Picalou, on their menu (although try to find anything about them online and you’ll be at a loss). Their chocolate and their cream is also imported from France, and these ingredients go into that wicked chocolate cake (laced with sel de guerande) and their quiches. 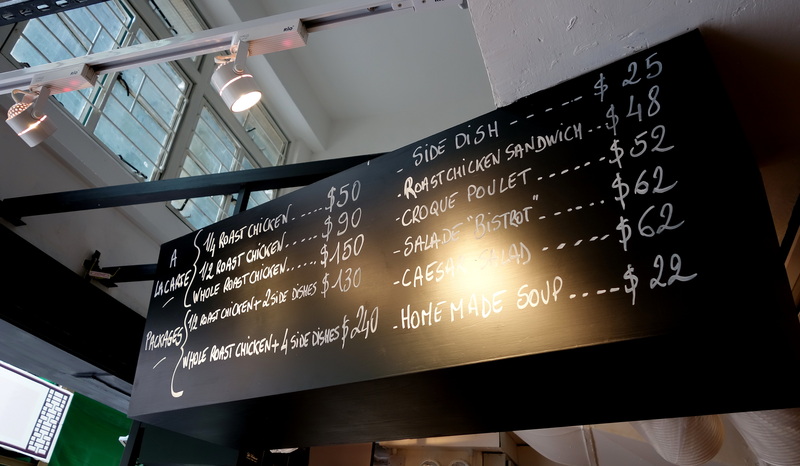 There are a few stools to sit on in-house, but really these chooks are meant to be taken away – a smart response to rising shop rents in HK, and the need for good food, fast. And since these meals are meant to be taken away, attractive packaging was also well thought out! The chicken is succulent, juicy and so very tasty. Make sure you specify (when you are ordering) whether you would like breast or thigh meat. I’m a thigh girl, and whilst this free-range chicken leg didn’t have as much meat on it as I would have liked, I was comforted in the fact that this chicken was happy, and therefore healthy. The herby potatoes, cooked underneath the spit in chicken juices and fat, and seasoned with herbs, were incredible. As I was sitting on my stool eating, I glanced into the kitchen as they were chopping and preparing the biggest carrots I have ever seen grown in Hong Kong – all of their sides are made on-site. I couldn’t resist getting a slice of their chocolate cake (and another slice to take home for PB so he wouldn’t get jealous) – it’s more of a tarte than a cake. 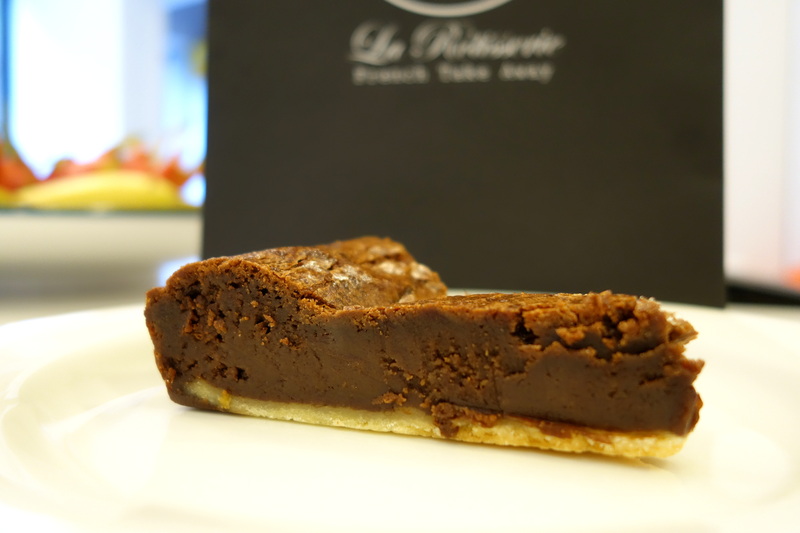 Made with Valrhona chocolate and the secret recipe of the chef, I took it home and followed their instructions – put it in the microwave for 10 seconds and ate it slightly warm. The sel de guerande really cut through the sweetness – I always love a little bit of salt with chocolate. 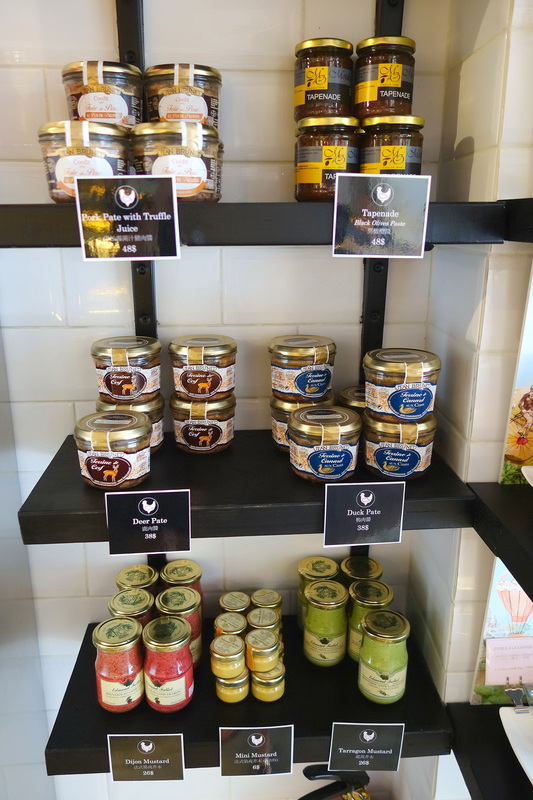 La Rotisserie also sell a selection of terrines and mustards, as well as sweets from La Madeleine de Proust. 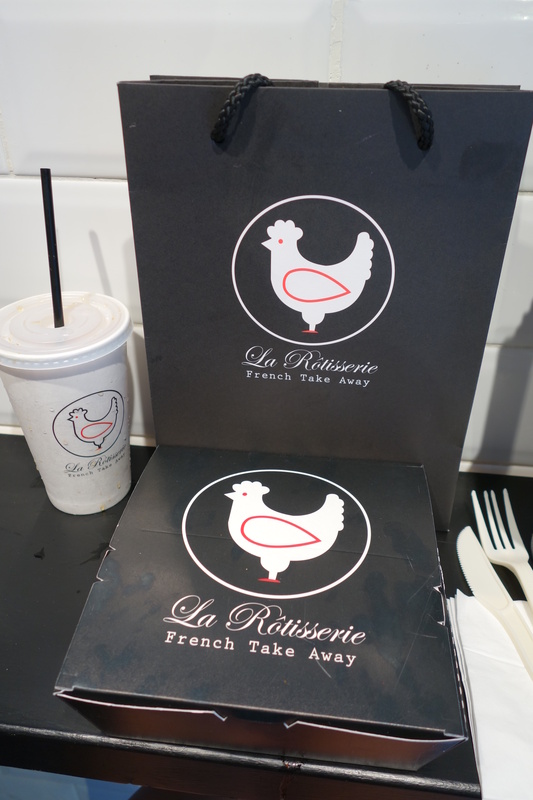 La Rotisserie is open from 12am until 9pm. If you would like to reserve a whole chicken for dinner (HK$150), you can call them any time during the day and pick it up any time after 4pm – they won’t reserve chickens for you during the lunch rush.